JOHN ASCOTT was the eldest child of John Ascott and Alice Perkin of Dunsford. Theirs seems to be the only Ascott family in Dunsford. When he was twelve, his mother died, leaving John with his father, two surviving sisters and a two-year-old brother. John married at twenty-three, to a local girl. SARAH SHILSTON came from a much more extended Dunsford family. They included at least three generations of men called Pentecost Shilston, suggesting Puritan sympathies in the past. Her father was John Shilston. A brother and sister died before Sarah was six, but she grew up with a younger brother and sister who were twins. She also had a host of cousins of various degrees in the village. John and Sarah were married in 1719. Their first child was born six months later. 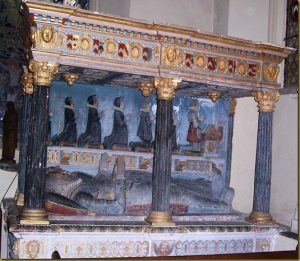 In all, they had five children baptised at the parish church, where a monument from 1610 shows the lord of the manor Sir Thomas Fulford, his wife and a row of seven kneeling children. There is no evidence of a terrible epidemic, such as cholera or plague. It is true that across the country the period 1727-31 was one in which fevers such as typhus and typhus were rampant, cancelling out the population growth since 1720. This could be an isolated outbreak. Yet no other family in Dunsford had multiple deaths that year. Indeed there had been no burials for several months previously and the total for the year is rather less than average. Perhaps the most likely cause is a fire which swept through the house while the family were sleeping. The two oldest boys, 12 and 9, may have been caught in the flames, while Sarah and her baby daughter escaped, only to die later of their burns. Whatever the cause, the tragedy swept two-thirds of John’s family away. He was left with just 7-year-old William and 4-year-old Richard. He did not remain a widower long. As with Sarah, relations with Catherine Gendall evidently began before their marriage. Catherine was then in the later stages of pregnancy. She was 34 and born in Dunsford, the daughter of John and Mary Gendall. Another daughter and son followed. There are two possible burials for John in Dunsford. 1744/5 John Ascott January ye 27th. 1758 John Ascott 4 June. No parentage is shown for either John, so it is unlikely that the 1745 burial is that of the four-year-old son of John and Catherine. The probability is that John senior died then, aged 48, and that the later burial is for his 18-year-old son. No burial or remarriage has been found for Catherine.